If you're looking to maximise your driving pleasure by gaining sharper throttle response, reduced turbo lag along with additional power and torque, then a performance engine remap is the product for you! JR Tuning performance remapping software is developed to work on a standard vehicle maintaining manufacturer levels of reliability and original service intervals. 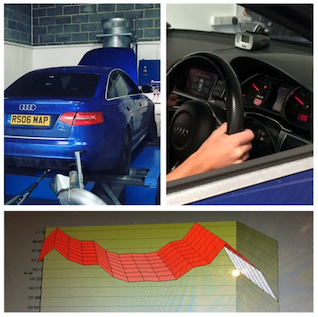 All of our remapping software is developed in-house and is written per vehicle to the customers requirements. We don't use off the shelf software, our developers write a bespoke map for your vehicle to meet your requirements. Maximising safe levels of horsepower. Performance remapping is essential for those drivers who feel their vehicle is not living up to its potential. By increasing the power of your vehicle you are providing yourself with a car that is safer for overtaking, more pleasurable to drive and puts the smile back on your face - all without the outlay of a new vehicle! By providing bespoke ECU software to meet your requirements we can eliminate flat spots, give you the throttle response you're comfortable with and tailor the power curve to match your requirements or driving style. Whether your car be a small petrol engine or a big muscle car, there's always improvements to be found within the engine maps. The benefits of gaining 8hp through a remap on a 1.0 litre petrol engine is as noticeable to one driver as it is for the driver of a 5.0 twin turbo engine which gains an extra 100hp+ as the percentage power gains are similar.. It's not always about peak power gains from remapping either. Improved vehicle response and a wider power band play a big part in providing an improved driving experience from a remap. Be it a track day car, supercar or the car used for the school run the benefits of a performance remap are endless. Fuel economy is dependant on driving style, however most customers don't report any drop in economy when moving to a performance remap, with some even reporting fuel savings! Pricing starts from £250 and we're so confident you'll love our performance remapping we offer a 14 day no quibble money back guarantee. If for any reason you're not 100% satisfied we'll return the car to standard, no questions asked, and issue a full refund. Call us today on 01622 320217 to discuss your requirements or to make a booking. Want to go one further and switch between different software programs? Our switchable ECU remapping offers a handheld programmer able to switch between standard and multiple modified programmes. Click here to read more about switchable ECU maps.